How fast will WebRTC go mainstream? And will it be "beyond the browser"? Oh, and thirdly, I saw a TV ad for Amazon Kindle the other day, featuring its Mayday live-help service. Common theme? WebRTC, but not in generic "video calls in your browser" style, nor for greenfield "standalone" communications, but to add a feature to an existing product. Mobile-messaging "OTT" player SnapChat acquired platform provider AddLive earlier this year, which it now uses as the basis for its integral video-chat service. While Snapchat's main service is "ephemeral messages" which disappear after viewing, it also now allows existing contacts to chat in realtime, while the camera button is held down. It's not used by everyone, but is interesting in that it's "WebRTC as a feature" and also in that it's not a traditional "person A calls person B for X minutes" model. And of course, SnapChat runs as a native app on smartphones, NOT as a site accessed via the browser. Amazon Mayday has long been discussed as a clever and expertly-integrated use of WebRTC video/screen-sharing for customer service and support. It is overlaid on an existing SIP-based voice contact centre platform. It does one-way video only, so again not a "call". And it's launched with a dedicated button, not as a browser/website action on the Kindle Fire. And then Freeconference.co.uk (owned by Iotum), which has an established audioconferencing bridge service using ordinary circuit dial-in. It's offering WebRTC (via the browser) but in audio-only mode at present. Again, it's putting WebRTC into an existing service platform and business model. 1) Is indeed commercially-viable, and in the "real world"
3) Is not just about "calls"
If I compare this to the situation a year ago, the change is staggering. It's very easy to miss the overall change in tone and relevance, when you're close to the coalface. Yet these examples - including run-of-the-mill radio and TV ads, and articles in mainstream business publications - are an indicator of what is to come. Those of you that have read this blog for a while will know that it's quite rare for me to be more enthusiastic than "the market" about a technology. Normally I'm the one criticising hype and deluded expectation. Yet I'd still say that WebRTC is an unusual example of something that is underhyped. It feels quite strange for me to be an advocate rather than a cynic. WebRTC moves fast. As part of writing my 2014 Edition research report, I'm trying to keep on top of all the various new market entrants, especially the proliferating range of platform and API providers. So I was unsurprised when a search threw up a new (and UK-based) WebRTC company called Streamserver. I clicked the link, thought "Oh, another one" and fired off an email to the CEO asking for a briefing, and inquiring how he was positioning and differentiating his company in an increasingly crowded space. Then I noticed something familiar - a reference to Double, the company making the cute telepresence robots that are familiar sights at WebRTC conferences (and which feature in most of my slide-decks). I know that Double has worked with Tokbox, so I was a bit surprised - maybe they had a better platform, and had ousted their rival? Maybe they provided a bit of software that was incorporated into Tokbox's platform? Then I had another look at the "About Us" page. The CTO's picture looked very familiar to me. But his name didn't ring any bells. One of his colleagues looked like somebody I'd met at a conference as well. Then I realised - the CTO, allegedly "John Bair" looked like the identical twin of Tokbox CEO Scott Lomond, who's almost as prominent a figure as the robots his WebRTC software powers. In fact, the whole website looked remarkably similar to Tokbox's - the people, the proposition, the customer references. The prices were much lower though. Initially I thought that maybe this was Tokbox trying a clever approach to price discrimination, or testing elasticity curves, with a cut-price sub-brand. Then I realised that giving pseudonyms to your executives is probably not best-practice for that type of exercise. Also, having no contact address, news, blog and - most-tellingly - no Twitter icon seemed dubious. So I asked Tokbox directly, and judging from their response on Twitter, something dodgy is indeed afoot. I'd probably best avoid too many defamatory comments, but it seems like I've uncovered a rather "clumsy" (*cough*) attempt to gather names or payment details illicitly. Now it could be that the company is legitimate, but it hired a dodgy website designer who's copied some content into a template, or who put the website up live, while it should have still been locked-down. Or maybe there's another wholesale explanation - but I'll leave that one up to Tokbox's lawyers. The other question is whether this is a one-off, or might get repeated elsewhere. I have no idea whether there are questionable cloud-services offers elsewhere in the web universe, although a search for cloud+fraud throws up various types of exploits. Presumably there are both financial and content/security-related risks in working with an untrusted WebRTC platform, although actual P2P media traffic should be secure unless it goes via a TURN or media-processing server. So I'd add "caveat emptor" to the already lengthening set of decision criteria about choosing a WebRTC platform. And I'd suggest that other platform players' web designers do an image search to see if their execs' mugshots are lurking elsewhere on the net. EDIT - I've also noticed that the copied Terms of Service page, here, clumsily leaves in TokBox's street address and even Lomond's name as DMCA contact. Oops. Disruptive Analysis was the first analyst house to publish a detailed study and forecasts on WebRTC, way back in February 2013. 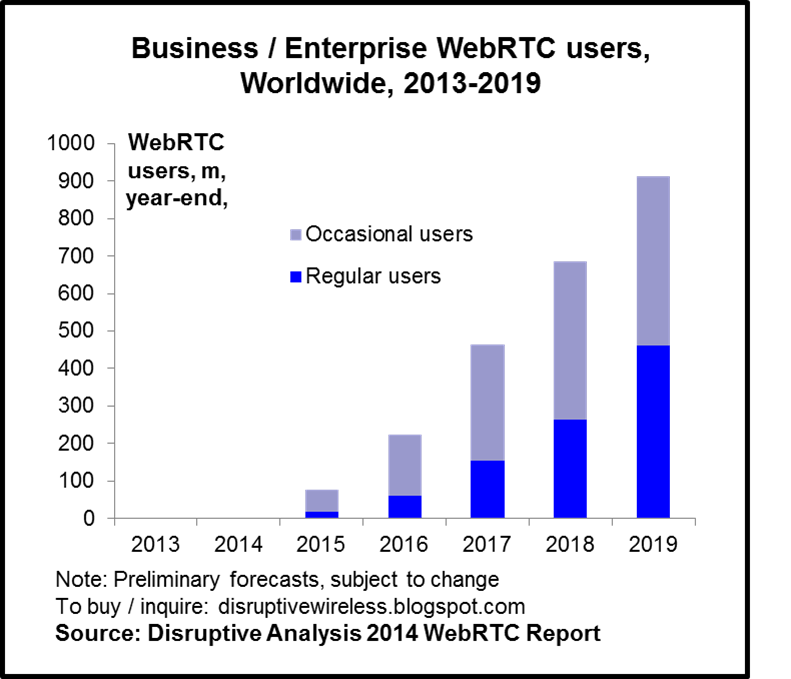 The continually-updated forecasts of device support (c4bn by end-2016) are used across the industry, with the exponential-type chart a standard feature of conference presentations. Now, Disruptive Analysis is preparing to launch a full refresh of the reference document on the industry's progress & forecast adoption rates. As before, it will cover all use-cases for WebRTC - enterprise B2C & B2B, consumer web, and telecom operators - adding in new analysis of areas like cloud platforms, real-time data, M2M/IoT and mobile WebRTC. The report will be published in the next few weeks and will be 100+ pages in length, including more than 30 charts, tables and forecasts. Data will include updated estimates of device support of WebRTC (including PCs, tablets and smartphones) with geographic breakdowns. Uniquely, there will also be quantified forecasts per major use-case. The report examines the shifting support of browser vendors and mobile platforms, including the role of ORTC, and 3rd-party cloud APIs used for creating WebRTC apps on mobile devices. As a preview of one of the new data-sets, Disruptive Analysis is releasing an important new forecast. By the end of 2019, the total number of business-related users of WebRTC will exceed 900m, worldwide. This will split fairly evenly between regular users and occasional users. The full report will have more detail, methodology and analysis of this dataset. The scale and scope of WebRTC adoption in enterprise and small-businesses is particularly stark, when one considers that there are only 300-400m conventional business "phone system" extensions or seats today using PBXs, IP-PBXs and UC. In other words, many or most business users of WebRTC will not get that capability from their normal business voice infrastructure. As well as today's main business communications platforms of UC, conferencing and contact-centres, Disruptive Analysis also expects a range of new middleware platforms to emerge, embedding WebRTC directly into other applications. Several vendors and cloud platforms are already enabing that type of capability - some will be integrated with existing systems, while others will focus on new standalone "islands". There is a parallel here with the telco world - a new class of customised business applications will embed "B2B-OTT communications", bypassing the classical central control of voice/UC vendor platforms, and with separate identity and security models. This is just one of the angles that the new 2014-edition Disruptive Analysis WebRTC report will cover. There will also be detailed examination of service-provider use-cases for WebRTC, as well as adoption by the general "consumer web" and mobile apps. All new online orders & payment for the existing WebRTC report (last updated in March 2014) will automatically receive the new report on publication. Click HERE to order the previous study. One thing I've noticed is that there's a surprising lack of voice-only use-cases for WebRTC. Video accounts for a far higher proportion of focus than could reasonably be expected. Indeed, when everyone lazily refers to WebRTC as "Skype in the browser", they almost always invoke an image of video chat or conferencing. You almost never hear terms like "VoIP in the browser" or "Vonage/Viber/etc in the browser". Now certainly, there are various WebRTC audioconferencing products out there (eg Uberconference, Drum, Iotum), while Vonage itself had one of the first mobile WebRTC apps deployed last year. And a number of internal contact-centre solutions use a browser dashboard and a headset instead of a traditional telephony platform. Twilio CX is a good example of this. Plivo and Tropo also have voice-centric cloud platforms. Telefonica's Tuenti WebRTC app is currently VoIP-only too, as is Movirtu's Cloudphone extension for 2G/3G voice. But these are exceptions. Most vendors, most apps and most WebRTC cloud API platforms are video-centric. It could be that video is just a harder problem for most developers, so WebRTC is a much bigger step forward. And of course, video is "shiny" and demo-friendly in a way that audio often isn't. It often needs bigger and better network boxes too, as well as smarts in mixing or transcoding that aren't (yet) as easy to commoditise or open-source at scale. And it needs lots of bandwidth, so understandably many people are keen to encourage its growth. All these are fair enough, and I agree with them. WebRTC will indeed catalyse huge growth in video uses and usage. But it doesn't get around the fact that the vast bulk of today's realtime communications is voice-centric. Apart from the history, there's a practical reason - a lot of people cannot or will not use video in many cases - either because it's dangerous (eg driving/walking), invasive, distracting or uncomfortable. And if a given person is willing and able to use video, say, 30% of the time, that implies that any two people can use it just .3*.3 = 9% of the time. And any three, four or more people even more rarely, unless it's a pre-arranged conference. "Spontaneous video chat" is therefore very rare, unless preceded by a voice/IM session that escalates. (A video call to a ready-and-waiting customer service agent like Amazon Mayday is a special case). So it seems strange that so few WebRTC applications and services are targeted at the audio-only, or even audio-primary marketplace. I have another theory about this. I'm starting to wonder if people just don't quite feel comfortable "talking into a browser", unless it involves video as well. The browser is such an image-centric application, that audio-only communications websites often feel a bit weird. This is true for one-way audio too - we still see most audio/music use in dedicated applications - Spotify and Pandora and iTunes are still use desktop applications, even if they have some browser capability too. Web-based conferencing/collaboration software often pops open a separate "phone" window, if it doesn't just avoid VoIP altogether. Such tools also often assume use of a headset. Some of this is a legacy of browsers needing plug-ins for audio communications - Flash, Silverlight and so on. (For music, it's also about DRM). There certainly have been a number of Flash-based PC VoIP websites in the past, but none has really emerged as a major winner. Talking into a headset or handset somehow feels quite "natural" to us. In particular, the speaker and microphone are in the right places, relative to our ears and mouth, so we don't feel like we're shouting - and can indeed modulate our speech down to a whisper if we want. We've also been habituated to it by 100 years of telephony. It's the middle category that's the problem here - talking into a PC or large tablet's integral mic, and listening to the other person via the device's speakers. Without video cues as well, it feels like you're either talking to an inanimate object, or hearing a "disembodied voice". If you can see the other person, you are able to suspend disbelief that you're conversing with a lump of glass and metal. You're not sure how loud you sound to the other person, and there's also the risk of feedback. You're also aware of the fact that you're broadcasting your conversation to your surroundings - especially if you're speaking unnaturally loudly to make sure the mic picks up your words. Now it could be argued that this will just drive video adoption further and faster, with WebRTC as another catalyst. And in some instances, it will indeed do that. But as already mentioned, video isn't always an option. In business, video can compromise confidentiality (eg the whiteboard behind you), or massively increase costs in a contact-centre scenario. For telcos, it brings a whole host of QoS and application issues, and increases transmission volumes multiple times, for an (at best) much more modest uplift in revenue. WebRTC-powered video will absolutely have many uses cases, but it equally certainly will never be ubiquitous or the default mode for all human communications. Therefore, there seems to be a significant gap for companies (or open-source) solutions to enable more pure-audio WebRTC than is currently seen. Use-cases where it can be assumed that headsets will already be being used, such as contact centres. Otherwise we face the irony and clunkiness of a plug-in free WebRTC service requiring the user to find and plug-in a physical device. Mobile use-cases, where WebRTC audio is baked-into an app. This is most obviously suited to telephony-style applications where the phone is held to an ear, but for some reason we don't seem to mind speaking into a smartphone or tablet from a distance quite as much as a PC. (Perhaps because it's held closer, typically). "Integral microphone & speaker" use-cases with much more well-designed UIs, that help overcome the cognitive dissonance of shouting at a machine. This might also mean WebRTC in standalone native applications, as an alternative to the browser. I'm not a designer or ergonomicist, but observation of other PC-based VoIP services might yield some clues. For example, it helps a bit if the service or website displays a static photo or avatar of the other person - your brain starts perceiving "he/she" as the target of your speech, rather than "it". There's also mileage in displaying other visual cues - perhaps a dial-pad, or a graphic of a microphone, or even audio level meter so you don't feel the need to shout. For audio-WebRTC to succeed, there will also be other considerations. For example, Skype maintains a little control-pad hovering in the foreground on a PC screen, even if the main app is behind something else (eg a presentation, or a notepad). Some of the proposed use-cases for WebRTC are going to need some more thought here - for example "click to speak" to a call-centre, or perhaps communications integrated directly into emails or adverts. Overall, I think that pure WebRTC-VoIP applications are something of a forgotten domain at the moment. Let's see if good design can provide a glass slipper for this Cinderella. Details of Disruptive Analysis' WebRTC research & update service are available here. Please also get in touch via the request form, or information AT disruptive-analysis DOT com about the forthcoming update release.